Selfridges are attempting to attract passers by with a double sensory assault. Audio visual agency Freehand have created a new window display installation for Selfridges of London. 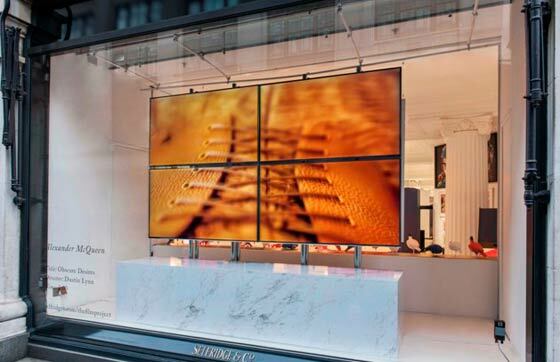 The shop window displays are enhanced by animated visuals from a Casio XJ-ST155 Laser & LED hybrid projector. To surprise people with sound the visuals are combined with a Whispering Window system from FeONIC. High street bricks and mortar stores have a tough and well documented fight on their hands against online retailers so getting people to take notice is a very important marketing science. Selfridges have employed UK AV agency Freehand to make a combined AV shop front display to get more attention on the street and more people into the store. Casio XJ-ST155 Laser & LED hybrid projector. The projector worked well with projecting designs and animation upon the naturally 3D shop windows display according to Freehand’s Mike Fabian. 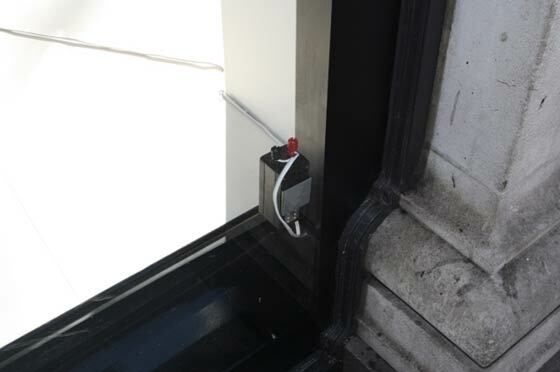 Selfridges new window displays are also incorporating sound courtesy of a FeONIC Whispering Window system. This system has been used before by Selfridges and other retailers but in combination with the projector animations and effects by Freehand should be even more effective. FeONIC claim the surprising sound coming from the window on its own can bring “Department Store sales increase of over 40%”. The sound isn’t an assault on the senses but is “subtle and unobtrusive audio” that catches the attention of passers by. The Whispering Window is quite an accessible technology and “Generally, the Whispering Window or Whispering Window Lite at £818 and £455 (ex VAT P&P) should provide all you need. Lite version for smaller windows.” It’s not just for shop windows, the technology can used to transform many solid surfaces into a speaker; shelves, mannequins, walls, floors, ceilings and partitions all work well. This little device makes the huge window into a speaker. Selfridges’ Window Production Manager said about the new windows; “The displays are on Orchard Street and it is amazing to see the number of people that are attracted to the display by the sound first, and then by what they consume visually. It’s a great spectacle.” Has anyone passed by Selfridges, London in the last week? Hmmm… time to visit Oxford street tomorrow then!